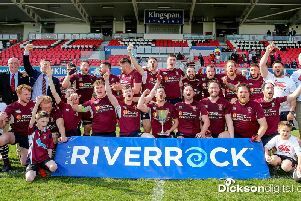 City of Armagh came from behind to once again lift the First Trust Ulster Senior Cup fiinal with a narrow but deserved win over Ballymena. In a repeat of last year's showpiece Armagh trailed for most, but rallied in the last quarter to seal the victory. Ballymena made good use of the breeze and kicked deep and from an Armagh '22' drop out the Braidmen put some further pressure on after a charge from Glenn Baillie. Armagh soon relieved the pressure and began to make some inroads themselves finally getting into the Ballymena half. Good carries from Phillip Fletcher and Neill Faloon and the influlence of outhalf Cormac Fox put them in a decent position in the Ballymena '22'. A penalty in front of the posts provided a simple opportunity for Fox to goal and open the scoring on 12 minutes. At the same time Armagh also lost fullback Ryan Purvis, replaced by Tim MacNeice. Five minutes later Ballymena eyed a penalty opportunity themselves, but from just inside his own half and even with the strong breeze behind him it may have been slightly ambitious from outhalf Tim Small - and it proved the kick off target and short. A huge effort from Ballymena at the scrum, number eight James Gallagher showing great ball control at the base, had Armagh in all sorts of trouble but little was to come from it and it was Armagh who had a sustained period of pressure with Neil Faloon again to the fore, but Ballymena's defence held impressively firm. Ballymena worked their way into the game after weathering the onslaught with captain Marcus Rea carrying strongly and the equally impressive backrow Conor Smyth making his presence felt, while JJ McKee was unlucky not to slip a tackle as the men in black neared the try line. But a penalty giveaway gave Armagh an easy exit out. However, in the last platy of the first half, off a scrum, Ballymena went down the blindside via scrumhalf Michael Stronge and he showed great gas before sending winger Johnny McMullan in at the corner. Small kicked a superb touchline conversion to send the Braidmen in at the break 7-3 lead. Ballymena started the second half strongly and had good claims for a yellow card after a deliberate knock-on as they moved ball along the backline. Small sliced the penalty effort. A big tutrnover at a ruck which turned into a penalty had Armagh players dishing out pats on backs all round, but again while they had oddles of possesion, Ballymena continued to defend stoutly. Fox looked to exploit some space in behind Ballymena with a with a chip, but again the Braidmen were wise to it. Eventually after much huffing and puffing a penalty came Armagh's way anbd Fox teed the ball up and goaled with ease to reduce the deficit to a point. Ballymena also lost Small to injury, replaced by Dean Reynolds. Armagh again went through the phases with another composed build-up, but between their inaccuracy and some stout defending, it looked as though the score would never come. A superb move through the backline looked certain to end with a try as Armagh had numbers on the right but Fox dropped a pass and that chance was gone. Ballymena fullback Rodger McBurney showed great composure when under pressure as he gathered a loose kick through, but under his own sticks he dummied the attack. Running across his own in-goal much to the alarm of his team, but he still forced a penalty after he was tackled, Armagh diving in over the top. And in a similar situation Reynolds in his own in-goal area attempted to clear but the ball went dead providing Armagh with a golden opportunity as the game ticked into the last 10 minutes. Off the second scrum - the first saw Ballymena penalised - Neil Faloon broke and drove but was held up close to the line. However another penalty came and this time with nine minutes remaining, Armagh opted for the posts and Fox delivered to put his side ahead 9-7. Shortly after Ballymena came in from the side at a ruck and Armagh popped the ball into touch as they looked to run t he clock down, but they lacked the composure of earlier and a penalty gave early exit to Ballymena - who failed to hold on to the ball and it was Armagh on the front foot again. Ballymena had little option but to throw caution to the wind - from anywhere - and Armagh's Evin Crummie almost got in for an intercept try only to drop the ball with the line at his mercy. Armagh then turned ball over at a maul and Neil Faloon was inches short of going over for a try. City of Armagh: Ryan Purvis, Andrew Willis, Christopher Colvin (Capt), Chris Cousens, Shea O’Brien, Cormac Fox, Harry Doyle; Paul Mullen, Andrew Smyth, Philip Fletcher, Joshua McKinley, Peter Starrett, James Hanna, Robert Whitten, Neil Faloon. Replacements: Jonathan Morton, Oisin Kiernan, Nigel Simpson, Evin Crummie, Timmy MacNeice. Ballymena: Rodger McBurney, Jonny McMullan, Matthew Norris, Glenn James Baillie, Darrell Montgomery, Tim Small, Michael Stronge; Nacho Cladera, Andrew Ferguson, Christopher Cundell, David Whann, Connor Smyth, JJ McKee, Marcus Rea (Capt), James Gallagher. Replacements: Jonny Spence, Josh Bill, James Taggart, Connor White, Dean Reynolds.